Hirasawa Noboru was born in Tochigi Prefecture in 1945. One day while in his twenties, he went to a store and saw a beautiful fish trap made of bamboo. He liked it so much that he wanted to buy it. When he asked the store owner for the price, he immediately had to give up the idea of making such a purchase. He learned that the basket was made by a master bamboo craftsman. An avid fisherman, that experience inspired Hirasawa to learn to make his own fish baskets. In 1985, he learned that Yagisawa Tadashi was holding bamboo basket making workshops. He participated in these workshops, and later became a student of the well known Yagisawa family. He eventually became a part time instructor of the Yagisawa family classes while also teaching industrial design at the local school. 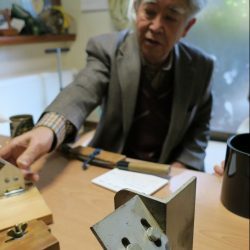 Hirasawa has actively exhibited his bamboo art in public exhibitions both locally and nationally. Hirasawa has won many prizes including the Governor’s Prize at the 10th National Art Festival in 1995. He became a full member of the prestigious Japan Traditional Craft Arts Association in 2004 after successfully admitting pieces to their annual competition four times. In 2006, he retired from his teaching position and had his first solo show to begin his career as a professional artist.